Kitsap County’s streams are getting generally cleaner when it comes to bacterial levels, according to an annual water-quality report issued by the Kitsap Public Health District. But streams can have good years and bad years — and 2017 was not so good. Let’s compare the annual report for 2016 to the newly released report for 2017, both found on the health district’s website. 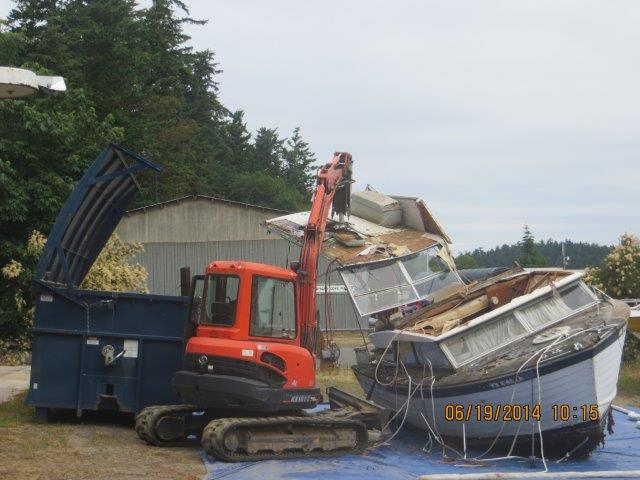 Reporter Tad Sooter offered a nice overview of the new report in a Kitsap Sun story on Friday. Before getting to the findings, it’s important to understand that there are two bacterial water-quality standards that must be met for a stream to get a clean bill of health. The first part calls for an average of no more than 100 bacteria per 100 milliliters of water (or no more than 50 bacteria if the water body has been designated “extraordinary”). The second part states that, regardless of the average, no more than 10 percent of the samples taken can exceed 200 bacteria per 100 milliliters of water (or 100 bacteria for “extraordinary” water). One reason that water quality got worse in 2017 was that rainy weather at times was more conducive to washing bacteria into the streams, according to Shawn Ultican, a water-quality expert with the health district. Similar patterns also were seen in 2009 and 2010, he said. More streams were deemed clean in 2016 than 2017. 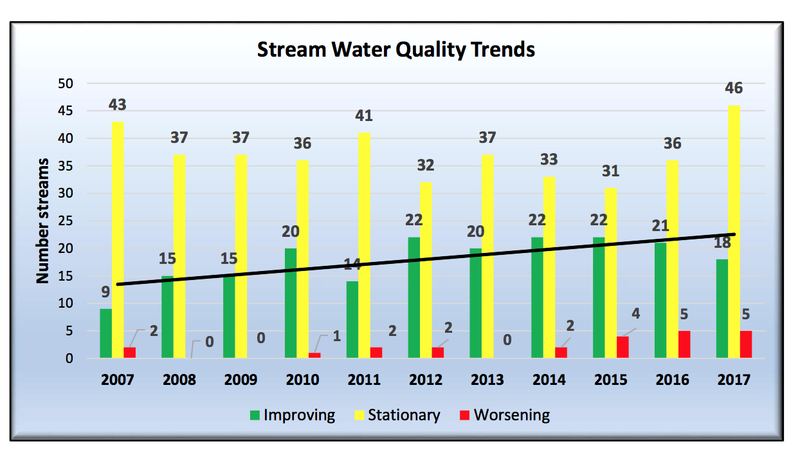 In 2017, 21 streams — 32 percent — met both of the water-quality standards, compared to 30 streams — 47 percent — the year before. For discussion, I took a look at reports in 2008, when 38 percent met both standards, and 2013, when 29 percent met both standards. So it really does vary from year to year. And whether a stream is considered clean or polluted depends on recent rainfall and other fleeting factors. Consequently, much depends on when a water sample is taken, which is why health officials choose their sampling dates randomly. Because weather plays an important factor in the bacterial counts, health officials tend to focus on long-term trends rather than on the results of individual water samples. Trends result from a statistical exercise using data collected each month over many years. For most streams, sampling has been going on for 22 years. In 2017, five streams were listed as worsening: Coulter Creek in South Kitsap; Lofall and Kinman creeks in North Kitsap; and Stavis Creek and the Tahuya River, which drain into Hood Canal. You might consider Stavis Creek and Tahuya River to be statistical anomalies, because they are so clean that it takes only a few additional bacteria to result in an unwelcome trend. Stavis Creek met both part 1 and 2 of the water quality standards in 2017, while the Tahuya River failed part 2 because of a few high counts. In 2016, both streams met both water-quality standards, so health officials aren’t worried about either stream at this point. In 2016, 21 streams were listed as improving, compared to 18 streams in 2017. 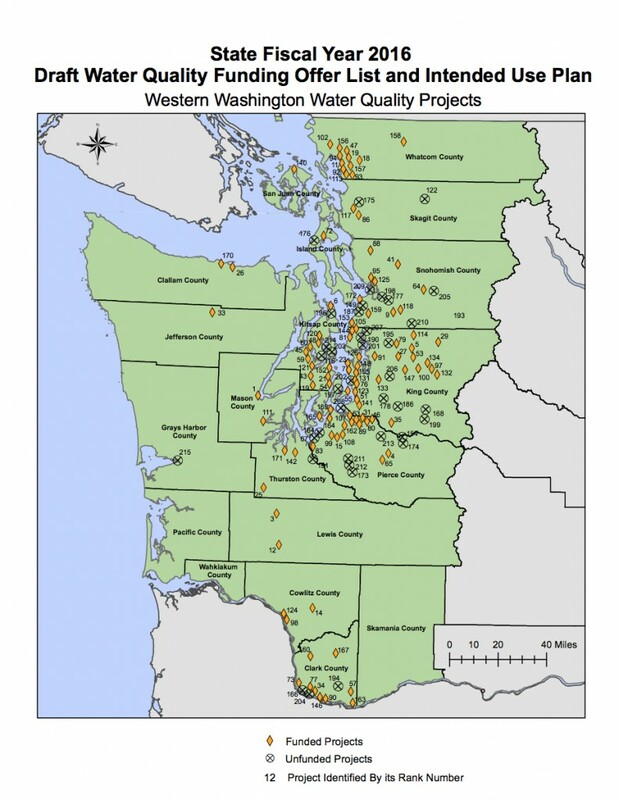 Olalla, Wilson, Barker and Chico creeks are among those that went from improving to stationary. Barker and Chico creeks are pretty clean, meeting both parts of the water-quality standards. Tad’s story in the Kitsap Sun includes an interactive map that provides the status of each stream in Kitsap County monitored by the health district. Lofall Creek, which includes drainage from the community of Lofall as well as upstream areas, has been giving health officials fits for years. Bacterial counts are high and getting worse, despite successful efforts to eliminate sources of pollution, such as failing septic systems and pet wastes. Special tests are planned to see whether pollution in the stream is coming from pets, birds or ruminants, such as cows and deer, according to Ian Rork, an environmental health specialist with the health district who is assigned the cleanup of Lofall Creek and nearby Kinman Creek. Health officials have long suspected that raccoons may be a source of the pollution, but they have no strong evidence. Raccoons are known to deposit their wastes in communal areas. As new development takes over uplands, these small animals may be pushed into remaining vegetated areas along the streams. Last year, Ian began a new effort to work closely with residents of the community to see if they could take steps to discourage raccoons and other wildlife from congregating near Lofall. Steps people can take include making sure animals don’t have access to garbage, keeping barbecue grills clean and avoiding the intentional feeding of raccoons. “The local residents have been so gracious and good to work with,” Ian told me, adding that most people are committed to solving the problem if only there were a clear answer. For the 2017 report, Lofall Creek remains the most polluted stream in the county, followed by Ostrich Bay Creek in Bremerton; Olalla Creek and Burley Creek, both in South Kitsap; and Kinman Creek and Vinland Creek, both in North Kitsap. The cleanest streams are Dewatto Creek, followed by Anderson Creek, Stavis Creek, Seabeck Creek, Salmonberry Creek, Big Beef Creek and Wright Creek. All drain into Hood Canal, except Anderson and Wright creeks, which drain into Sinclair Inlet, and South Kitsap’s Salmonberry Creek. Climate change is expected to bring more intensive rainstorms, but how that will affect long-term trends in water quality is yet to be seen. BirdNote, the radio program, has been bringing us the amusing sounds and stories of birds for more than a dozen years. 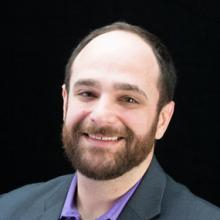 Now, a new managing producer, Jason Saul, is working to expand the horizons of the daily two-minute show that can be heard on more than 200 public radio stations across the country. Jason chose Bremerton as his personal base of operations. He can work out of his home and head to Seattle for meetings and recording sessions as needed. Jason, who moved from New Orleans, says Kitsap County has everything he needs, and he enjoys the local low-key atmosphere of this area. Read on for more about that later. BirdNote began as a project of Seattle Audobon, which created a team of writers, scientists and sound artists to portray accurate and intriguing stories of birds. The program went on the air in February 2005, when it was launched by KPLU-FM, an NPR affiliate that now goes by the call letters KNKX. BirdNote became its own separate nonprofit organization in 2006, funded mainly by donors who love the show. Today, it can be heard in big and small markets across the country, as well as well as in podcast format whenever people choose to listen. The two-minute radio show will continue as always, but Jason tells me that he is pushing to expand the storytelling beyond the traditional bird-of-the-day into stories of people as they relate to birds. The Port Orchard Seagull Calling Contest is proposed as a feature story, currently scheduled for October. Because the two-minute program is already available on numerous podcast websites, BirdNote has begun to offer expanded podcasts for people who can’t get enough. These won’t be heard on the radio, at least for now. To launch the expanded format, the program commissioned a new theme song, based on the short jingle that introduces each BirdNote segment. The songwriter, Ben Mirin (a.k.a. DJ Ecotone), has a rare love of natural sounds, which he brings back to the studio and adds his own voice to create an amusing beatbox flavor. Here’s the song that DJ Ecotone came up with. Can you identify 12 different bird calls? Jason thought it would be nice to introduce the new theme song and longer format by interviewing Mr. Ecotone. I have to admit that I found the interview intriguing, as Ben describes his passion for nature and music. The interview can be heard in the box below. As for Jason, he, too, has a passion for the environment, and he has embraced the unique style of BirdNote’s storytelling. His goal is to keep the program fresh as people absorb information in new ways. Getting people into the stories about birds — such as a narrative report on an organized club of teenage birders in San Bernardino, Calif. — should broaden the interest, he said. Transcripts of the podcasts are available for those who would rather read than listen to the stories, Jason noted. People can keep up with the new features and photos on Facebook, Twitter and more, or enjoy the archived programs that were missed the first time around. Extra tidbits can be found on BirdNote blog. While individual donations are the mainstay of BirdNote’s budget, the organization has begun to accept donations from corporate sponsors compatible with the mission of bringing the wonders of birds to the public. Jason started his media career in New York and moved in 2003 to New Orleans, where he reported on regional stories, such as Hurricane Katrina and the BP oil spill. From 2006 to 2011, he served as a researcher and production associate for “American Routes,” a popular radio show featuring Nick Spitzer. Before moving to Bremerton, Jason was director of digital services and corporate development for WWNO, the New Orleans public radio station. Jason, who lives off Burwell Street in West Bremerton, maintains production equipment in a corner of his house, so he can do much of his work at home. BirdNote is based in Seattle, with offices in one location and a sound studio in another, but Jason always chooses to live in places somewhat removed from the cosmopolitan atmosphere. The public library system is as good as that in New Orleans, he said. The buses run on time, and it is easy to get around. “The natural beauty is amazing,” he said, adding that Olympic National Park is a true wonder. 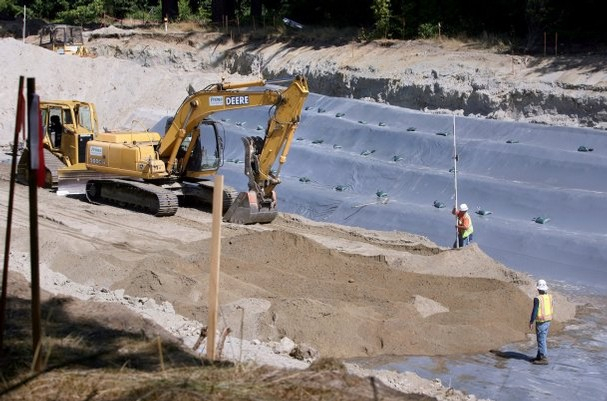 Detailed planning and design, followed by thoughtful construction projects, have begun to tame the stormwater menace in Clear Creek, an important salmon stream that runs through Silverdale in Central Kitsap. 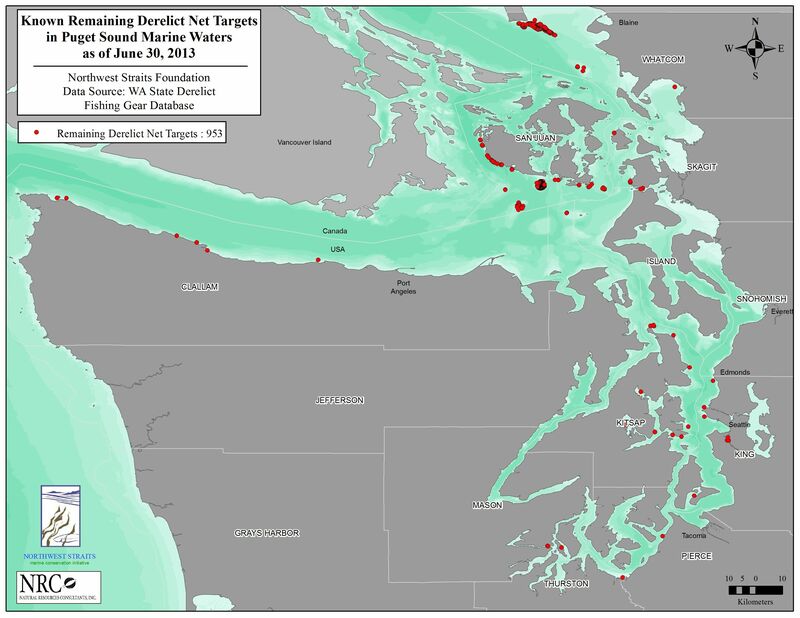 Stormwater has been identified as the greatest pollution threat to Puget Sound. 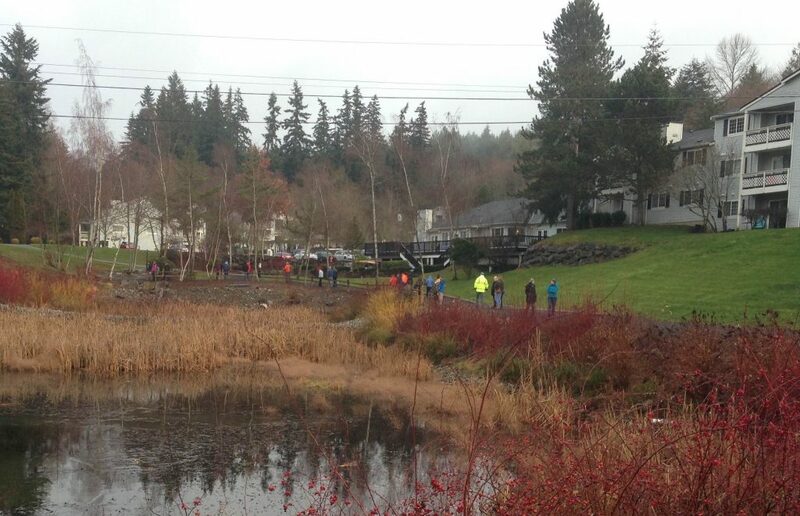 In Kitsap County, many folks believed that the dense development pattern in and around Silverdale has doomed Clear Creek to functioning as a large drainage ditch for runoff into Dyes Inlet. But reducing stormwater pollution is not beyond the reach of human innovation, as I learned this week on a tour of new and planned stormwater facilities in the Clear Creek drainage area. The trick is to filter the stormwater by any means practical, according to Chris May, director of Kitsap County’s Stormwater Division and a key player in the multi-agency Clean Water Kitsap program. Projects in and around Silverdale range from large regional ponds of several acres to small filtration devices fitted into confined spaces around homes and along roadways. The U.S. Board on Geographic Names on Thursday approved the map correction outlined in this blog post. The change was made on a vote of 15-0 with one abstention after the board heard the explanation about why the correction was needed. If you check for the name “Heins” on the Geographic Names Information System, the official names database, you will find updated coordinates for Heins and Alexander lakes. If you plot the coordinates, you’ll probably find that the map still bears the incorrect name. I’m not aware of any map that has been updated, but this should take place over time, according to officials with the U.S. Geological Survey. A pair of lakes long hidden within Bremerton’s vast watershed — Heins Lake and Alexander Lake — should have their names reversed on future maps, according to officials with the U.S. Board on Geographic Names. The switch-around is designed to correct a map error that apparently occurred in 1953. The map correction, scheduled to be endorsed March 12 by the federal naming board, will fulfill efforts by Sue Hein Plummer to get the maps corrected. Sue is a descendant of the homesteader for whom Heins Lake is named. I met Sue in 2012 when I accompanied members of her family to the old homestead in the watershed (Kitsap Sun, Sept. 30, 2012). It was then that Sue told me that the names had been reversed on an old Metsker’s map sometime after 1928, and she had been unable to convince the mapmakers to change it back. Sue is a history buff and the genealogist in the family. The old homestead was closest to Heins Lake, which has been called Alexander Lake on all modern maps. It frustrated her that mapmakers wanted to leave the names alone, wrong as they were. She knew that if she did not get the names corrected soon, they could stay wrong for all eternity. Odd as it seems, we might be stuck with Heins Creek running out of Alexander Lake. when it should be associated with Heins Lake, she said. I told her about the Washington State Committee on Geographic Names, which has the power to change any name in the state. With her extensive research, I thought she would eventually convince both the state and federal naming boards to make an official change. It never went that far, because staff of both boards came to recognize the error, so a name change was not needed. All that is needed is to change the location of Heins and Alexander lakes in the Geographic Names Information System — a database that records the official names and locations of geographic features. During an investigation, Jennifer Runyon, a staff researcher for the U.S. board, found some field notes from 1953, in which two people working at the Gorst Creek pumping station said the name of the northern lake should be Heins — opposite of what the maps said in 1937 and before. “Mr. Jarstad” is presumably Otto Jarstad, for whom the city park at the abandoned pump plant is named. Sue Hein Plummer thinks the mistake may have been made on some maps before 1953 and that Jarstad and Moritz just wanted to leave the names alone. Kitsap County Auditor’s Office has already made the change on county maps. Runyon told me the change is likely to be made in the federal database within two days of the March 12 meeting of the U.S. Board of Geographic Names, — assuming no further issues arise. By the way, Heins Lake — which probably should have been “Hein’s Lake” based on the name Hein — now belongs to Ueland Tree Farm as a result of a land trade with the city of Bremerton. At least that’s what the maps indicate. Check out Josh Farley’s story, Kitsap Sun, April 14, 2014. 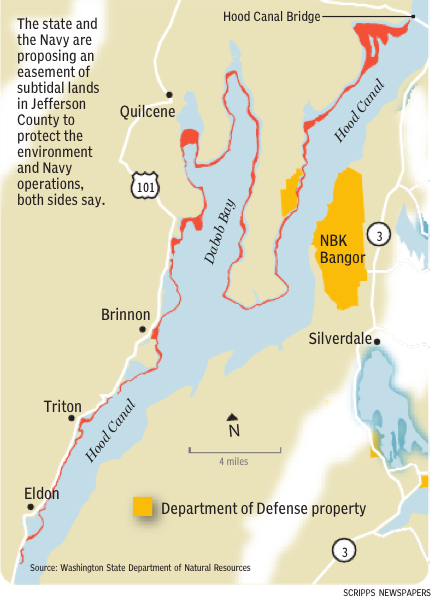 Once the maps get corrected, Ueland will actually own Alexander Lake — the northernmost lake — and Heins Lake will remain in the Bremerton watershed. Bremerton continues to lead cities its size in the National Mayor’s Challenge, a program sponsored by the Wyland Foundation to encourage people to conserve water and energy, reduce waste, and do other conservation-minded things. The challenge runs through April, so there is still time to join with other Bremerton residents or else boost the results for any city you wish to support. The pledge is basically a list of 17 conservation questions, and you just check a box for commitments you are willing to make — either with new practices or with ongoing good habits. To start, you name your city. Bremerton was the winner last year among cities with populations from 30,000 to 100,000. As they did last year, Bremerton Mayor Patty Lent and her staff have done a good job in spreading the word about the contest, which includes prizes. I’ve seen posters in local stores and restaurants. Following Bremerton in its population category are Folsom, Calif., and then Greeley, Colo. Since I wrote a story about this for the Kitsap Sun (subscription) on April 11, Seattle has moved up from seventh to fourth place among the largest cities (600,000 and over). No other Washington cities have made it into the top 10 for any population group. In Kitsap County, Port Orchard is ranked 44; Poulsbo is ranked 162; and Bainbridge Island is out of the running at this point. Several other cities are close to 100. If anyone sees his or her city moving into the top 100, please let me know.